"In memory of all those who fell and all those who served." the Memorial Gates at the Tokomaru School were yesterday opened by the Governor-General, Sir Willoughby Norrie. The gates are of simple but impressive design and bear the words, "Pro Patria-1914-1918 1935-1945." After the gates had been dedicated, Lady Norrie cut the ribbon, and his excellency opened the Gates. On his arrival at Tokomaru at 2.45pm the Governor-General inspected a Guard-of-Honour of local ex-service-men under the command of mr G.E. Allright. After the official party had mounted the dais beside the Memorial Gates, Patricia Waghorn presented a bouquet to Her Excellency. Mr A Woodd, President of the Home and School Association, extended a cordial welcome to their Excellencies on behalf of the Association and the people of Tokomaru who, he said, were fortunate to have the Governor-General present to open the Memorial Gates. The Memorial was to those who served their country and made the supreme sacrifice and to those who served and returned. Thanks were due to the people of the district who subscribed to the funds necessary to erect the Gates, he said. Mr J.A.V. O'Hagan, Chairman of the Tokomaru School Committee, thanked the Home and School Association and the people of Tokomaru for supporting the school so generously. 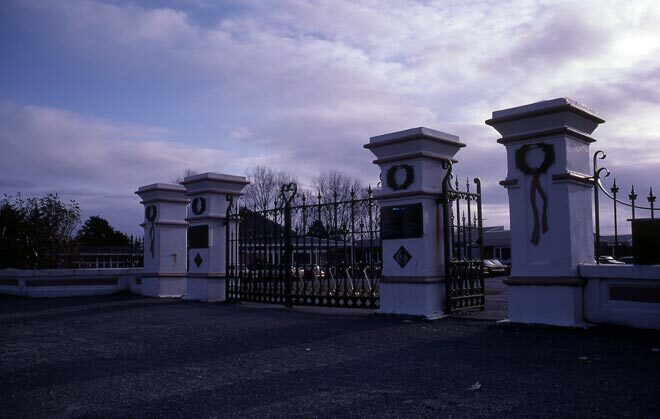 Mr V Cottle, a member of the Wellington Education Board, said the Gates were erected in an appropriate position, for they would be an everlasting reminder to the children passing through them each day of the sacrifice that men had made so that the British way of life could go on. Mr Belgrave then sounded the last post and the crowd sang two verses of the hymn, "O God our Help in Ages Past." A prayer followed and the Rev, H.G. Boniface dedicated the Gates. His Excellency congratulated the Tokomaru area on producing so many members of the Guard-of-Honour. He was glad, he said, that so many children were present because it was they who should remember what was taking place that afternoon. They were gathered to commemorate and honour the human endeavour of those who lived in the Tokomaru District and began their education at the school, said Sir Willoughby. To the parents and relatives they owed a full measure of gratitude and admiration, he continued. They gave unflinchingly and without question. Those who fought and those who died and cherished the hope that it was a war to end wars. "However, a new world cannot come until we ourselves change," his Excellency declared. "A changed world means changed people and the only way to change people is through some power outside ourselves and, above all. Living in the presence of God." The Governor-General said it was his privilege to have served alongside New Zealanders in both World Wars when he learned much of their gallantry in battle. No troops could have fought better or more valiantly. Lady Norrie then cut the ribbon and his excellency opened the gates and laid a wreath which was brought forward by Barbara Gordon. The National Anthem concluded an impressive service. The Governor-General, Lady Norrie, and Miss Rosemary Norrie, before their departure, spent some time talking to the children and adults. His Excellency again won the hearts of the children by exercising his prerogative and declaring a school holiday today. Before his departure from Tokomaru, Sir Willoughby visited the Returned Servicemen's rooms. (There are no names on the Memorial Gates, but an honours board is in the Tokomaru Hall remembering the men who fought in both WW1 and WW11).